I’ve never been to New York City, but I know that when I do someday, Alice’s Tea Cup will be my first foodie stop. My mom owns about a zillion cookbooks, and one that I always love to browse when I’m home was created by the owners of the NYC area chain of tea shops. It’s aptly named Alice’s Tea Cup and it is full of recipes for fun teatime sweets, breakfast treats, and even good info about the proper way to brew tea. I’ve made a scone recipe from the cookbook that was just so-so [probably because I didn’t make the buttery glaze to go on top], but I wanted to give the cookbook another chance. I am so glad I did, because Alice’s Vanilla Tea-Infused Granola is simply magnificent. This phenomenal granola combines three types of nuts [almonds, pecans, walnuts] plus sesame seeds and coconut, as well as two types of dried fruit to make a nutty-sweet comination that is absolutely essentail in a good granola. It is a bit more museli-like than a traditional chunky granola, but that doesn’t detract from it’s crunch. But the real added bonus to this granola comes from its spices: the usual suspects of cinnamon and nutmeg… and vanilla tea! I’ve never used tea as a spice before, so I was a little unsure what it would be like, but it’s absolutely wonderful. The tea adds some delicate sophistication to the crunchy hippie treat [ha, ha]. Overall, this is a granola recipe that is perfect as is… but could definitely be improvised based on the contents of the cupboard. 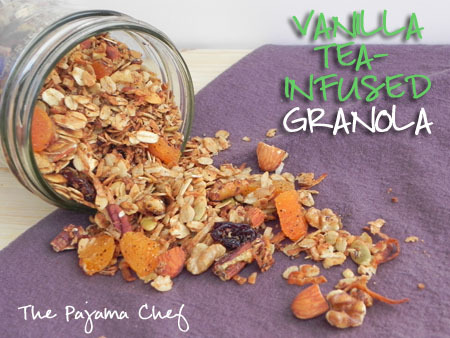 We enjoyed it served over yogurt or with milk, but as with any other granola recipe… the possibilities are endless. I can’t wait to make it to NYC to try the original version, but for now, I’m glad I can enjoy it at home when the mood strikes. Preheat oven to 350 degrees, and spray a large jelly roll pan with cooking spray. In a large bowl, mix together all ingredients except honey and butter. Mix together thoroughly, then stir in honey and butter. Spread the mixture on prepared baking sheet, and pack down with a spatula. Bake for 20 minutes, flipping at the halfway mark. Remove granola from oven when it is golden brown. It will harden as it cools. 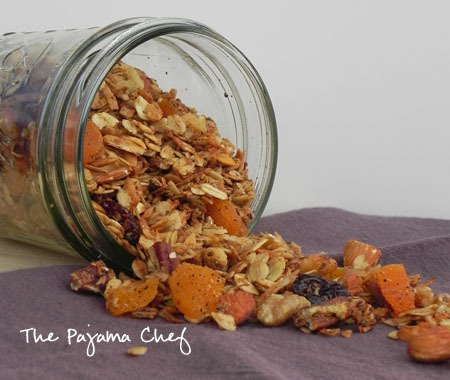 Break granola into chunks and store in an airtight container. Serve with milk or yogurt. My mom is obsessed with tea. We are actually planning a trip to NYC this summer so we will have to definitely make sire we visit this place. This looks lovely, and the idea of using vanilla tea as a “seasoning” is so cool! apparently it’s somewhat common… i’ve seen recipes for green tea cupcakes and such, and want to try it out again! Tea-infused food is so cool! I just tried a Vanilla Tea Infused Gelato at a food show a few weeks ago – such a delicate, wonderful flavor! I’d say it compares pretty favorably! I made a few modifications (bf is allergic to walnuts, and we had no dried apricots but lots of candied ginger), but the result is still delicious — and definitely a recipe I’ll be coming back to. Thanks for posting this!